Well, here’s the latest example of the Democrat-media complex in action. 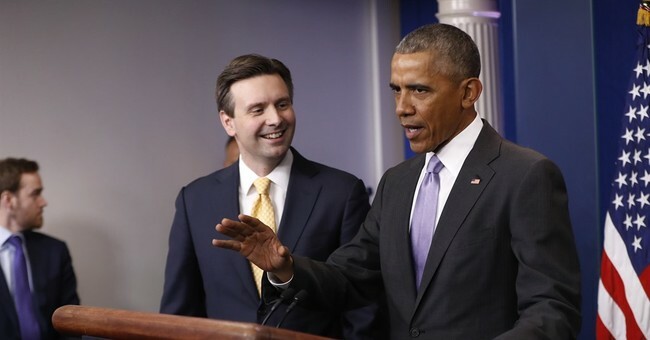 Former Obama Press Secretary Josh Earnest joined NBC News and MSNBC as a political analyst in March 2017. On Tuesday, however, he blasted a fundraising email for the Democratic Party. Need To Know Network noted how one of their political analysts was helping his party raise cash for the upcoming 2018 elections. It’s not that we didn’t know NBC News had a tilt, or that Josh Earnest would most likely do his part to keep Obama polished and keeps liberal blood pressures at healthy levels; that’s all they do at MSNBC. Yet, can you imagine if an ex-GOP White House aide joined NBC News and then sent fundraising emails to support his party for the upcoming midterms, elections that he or she would be responsible for providing analysis for millions of viewers, given that NBC is part of the big three; the other main networks being ABC and CBS. I’m pretty sure liberals would go ballistic. Yet, we know the networks are biased. The people who occupy the newsrooms are biased, so this rather unethical breach flies under the radar. If Earnest was an opinion writer or worked for a biased media outlet, it’s a different story. This is NBC News, which is supposed to be down the line and tries to carry itself as such, despite its left-leaning biases. But if you want an explicit example of the Democrat-media complex at work, well, here it is.